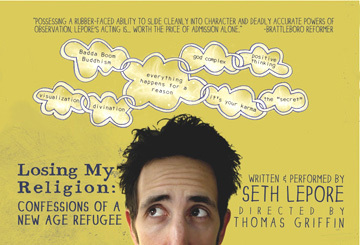 Confessions of a New Age Refugee"
Seth Lepore brings his one-man show, "Losing My Religion: Confessions of a New Age Refugee," to the Arlington Center for the Arts, 41 Foster Street in Arlington, on November 11 & 12. The production is directed by Thomas Griffin. Written and performed by Lepore, "Losing My Religion" is described as a humorous and ironic look at "the blurry line between self-help and faith." Based on Lepore's own spiritual journey, which saw him leave the Catholic Church as a teenager and meander for over 20 years through Buddhism and a host of other isms, the monologue juxtaposes funny and insightful characterizations of the people he has met along the way with thoughtful commentary on his own spiritual seeking. Lepore, who won the Audience Encore Award while performing the show on the Fringe Circuit, says intention of the piece is to create an ongoing dialogue that presents more questions than answers in terms of how we approach faith as a culture. DCtheatrescene.com commented, "[Lepore]… shows the perils of trying to embark on a spiritual journey when you have the intensity of a true believer but the direction of a lost soul… [and] shows off his integrity as a writer, directing the audience’s laughter at a commentary on the faux-spirituality industry, rather than the motivations of people who buy into it." For ticket information, call 800-838-3006.